I am a 25-year-old graduate working for a medium-sized organisation that operates in the service industry. I joined this company while at university and transferred to my current department right after graduation. I was encouraged by the firm’s management to enter a leadership development programme. The programme is scheduled to begin in September 2018 and will take two months. This is a good opportunity for me to further develop my leadership skills and competencies. However, I firstly have to conduct a personal analysis in order to identify my strengths and weaknesses as well as the potential areas of further development. This analysis is conducted with the help of the SWOT framework, which uncovers my strengths and weaknesses, opportunities and threats (Dugan, 2017). According to the trait theory of leadership, effective leaders should possess a wide range of physiological, demographic, intellective and task-related characteristics (Owen, 2015). As noted by Rickards (2015), successful leaders have interests, personality traits and abilities, which are different from those of the less effective leaders. In my opinion, I possess certain skills and qualities, which can allow me to become a good leader in the future. For example, my communication skills are well-developed. I can effectively communicate with both individuals and groups and express myself in a clear manner without engendering murkiness or confusion. At the same time, I must say that the lack of experience as a leader may limit my ability to effectively and clearly formulate directions for the company’s employees. Self-confidence was also argued by Lussier and Achua (2015) as one of the most important traits of a successful leader. I can take risky decisions and accomplish complex tasks. Nevertheless, I totally accept responsibility for these decisions and their potential failure to achieve the initial goals. My analytical and conceptuality skills are also well-developed as I am able to visualise, articulate and solve complex problems and work effectively under pressure. I totally understand that the business world of today is fast-changing (Nevarez et al., 2015). That is why, I am trying to be as flexible in the workplace as possible. As a leader, I accept whatever changes come their way and take my leadership decisions in the light of these changes. According to Northouse (2015), the planning process in the context of leadership implies setting a vision for a company as well as realising this vision through achievable objectives. I must admit, however, that I am experiencing certain difficulties with the strategic planning process. My understanding of the planning process is still too limited to allow me to become an effective leader. My experience in leading and managing others is not considerable, which, in my opinion, is the main reason for the previously noted weakness. 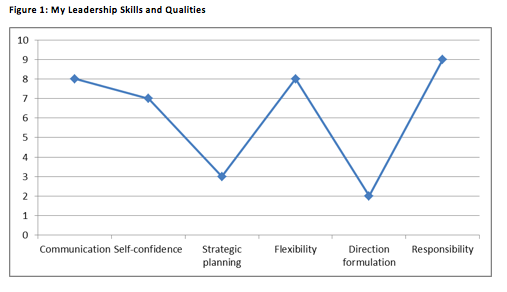 The extent to which my leadership skills and competencies are developed can be presented by means of the following chart, where 10 is ‘highly developed’ and 0 is ‘not developed at all’. Based on the personal assessment above, I can say that the development of my skills and qualities in formulating directions for subordinates and in the planning process are the main opportunities provided by the leadership development programme. At the same time, it may be difficult to maintain a reasonable work-life balance during my academic studies. In accordance with Braun and Nieberle (2017), leaders’ inability to maintain this balance can result in negative attitudes (e.g. anxiety and anger) and ultimately lead to burnout. The objectives for my personal development are formulated with the help of the SMART criteria, which imply that objectives must be specific, measurable, achievable, relevant and time bound (Nevarez et al., 2015). These objectives are presented as follows. To further develop my skills and qualities in formulating the directions for subordinates by the end of November 2018. To contribute to my ability to set a vision for my company/department and realise this vision through achievable objectives by the end of December 2018. To widen my understanding of leadership by the end of December 2018. 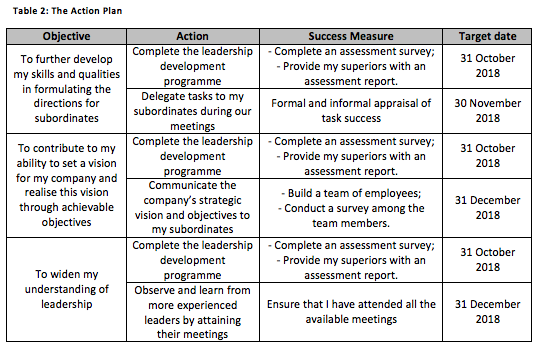 The action plan, which contains the development goals, actions, success measures and schedule goals, is presented by means of the following table. Each objective requires two actions to be performed. The first action is to complete the leadership development programme by the end of October 2018 and provide my superiors with an assessment report. In turn, the second action requires the practical application of my newly developed leadership skills and competencies within the next two months. I am planning to achieve the first personal development objective by completing the leadership development programme. I believe that this programme will contribute to my leadership knowledge and will help me formulate clearer directions for the company’s employees and, hence, add to their productivity and performance in the workplace (Lussier and Achua, 2015). I am planning to measure the effectiveness of this action by completing an assessment survey and providing its results to my superiors. It should be noted, however, that this assessment method can result in the production of biased and subjective data as its results would be based exclusively on my own perceptions (Rickards, 2015). The practical side of the first objective will include delegating tasks to my subordinates during our post-programme meetings. During this phase, I will be able to apply my newly acquired leadership skills and competencies in a practical context. The effectiveness of my ability to formulate directions for subordinates will be assessed on the basis of formal and informal appraisals of task success (Dugan, 2017). The next personal development objective will also require performing two actions. Similar to the previously discussed objective, the first phase of the second objective will require the completion of the leadership development programme. In turn, after the assessment of my newly developed leadership skills, I am planning to communicate my organisation’s strategic vision and objectives to my subordinates to identify whether I can use these skills in practice. For this purpose, I am planning to create a team of employees and communicate the firm’s vision and goals to its members. As noted by Lindsjorn et al. (2016), individuals demonstrate higher levels of commitment and engagement working in teams. Thus, by building this team, I will be able to assess my strategic planning skills in a more effective manner. To measure the success of this action, I am going to conduct a survey among the team members. Although this approach to success assessment is preferable, the team members can provide the answers they think they are expected to provide (Saunders et al., 2015). This fact can be viewed as a threat to the credibility of the obtained responses. Finally, the third personal development objective, which is to widen my understanding of leadership, is going to be achieved through the completion of the leadership programme. Nevertheless, I am planning to broaden my leadership knowledge by observing and learning from more experienced leaders. For this purpose, I will attend all the meetings of these leaders that will be held during a two-month period (November-December 2018). In accordance with Nylund and Raelin (2015), knowledge sharing allows for ensuring that knowledge is articulated and accessed by all organisational members. At the same time, Tee (2015) noted that only explicit knowledge can be shared. Hence, by attending these meetings, I will not be able to capture tacit leadership knowledge, which can be viewed as a limitation of the selected success assessment method. The participation in the leadership development programme is expected to help me further develop my leadership skills and qualities in formulating directions for subordinates; contribute to my ability to set a vision for my company and realise this vision through achievable objectives; and widen my understanding of leadership. At the same time, practical actions are also needed to ensure the effectiveness of this programme. For this purpose, I am planning to arrange frequent meetings with my subordinates, actively delegate tasks during these meetings, facilitate teamwork and learn from more experienced leaders. Completing the leadership programme (September-October 2018) is not a finite goal, but rather a start in developing my understanding of practical leadership. Braun, S. and Nieberle, K. (2017) “Authentic leadership extends beyond work: A multilevel model of work-family conflict and enrichment”, The Leadership Quarterly, 28 (1), pp. 780-797. Dugan, J. (2017) Leadership Theory: Cultivating Critical Perspectives, Chichester: John Wiley & Sons. Lindsjorn, Y., Sjoberg, D., Dingsoyr, T., Bergersen, G. and Dyba, T. (2016) “Teamwork quality and project success in software development: A survey of agile development teams”, Journal of Systems and Software, 122 (1), pp. 274-286. Lussier, R. and Achua, C. (2015) Leadership: Theory, Application, & Skill Development, London: Cengage Learning. Nevarez, C., Wood, L. and Penrose, R. (2015) Leadership Theory and the Community College: Applying Theory to Practice, Sterling: Stylus Publishing. Northouse, P. (2015) Leadership: Theory and Practice, New York: SAGE. Nylund, P. and Raelin, J. (2015) “When feelings obscure reason: The impact of leaders’ explicit and emotional knowledge transfer on shareholder reactions”, The Leadership Quarterly, 26 (4), pp. 532-542. Owen, J. (2015) Innovative Learning for Leadership Development: New Directions for Student Leadership, Chichester: John Wiley & Sons. Rickards, T. (2015) Dilemmas of Leadership, London: Routledge. Tee, E. (2015) “The emotional link: Leadership and the role of implicit and explicit emotional contagion processes across multiple organizational levels”, The Leadership Quarterly, 26 (4), pp. 654-670.